Since ancient times, the importance of sleep has been aware as it is necessary for human body to recover from activities. However, many have difficulty sleeping and this tendency is increasing throughout time, especially in modern society. It is an alarming phenomenon because either lack of sleep or poor quality sleep will affect seriously individual health and the whole society’s productivity. Among them, sleep apnea is one of the most worrisome problems. In this article, we would introduce some background information about sleep apnea and most importantly, how to stop sleep apnea. Sleep apnea can be described as the condition in which you have uncontrollable breathing pauses or shallow breathes when you are sleeping. And you will wake up suddenly (1). Although there is no standard for all sufferers, it is likely that sleep apnea causes up to 30 times of stopping breathing on the hourly basis. This problem is an obstacle for you to have great quality sleep. It is even more dangerous than snoring because it can put your life in danger. Uncontrollable breathing pauses may make your brain receive less oxygen, which has negative impacts on your health. According to scientists, one of the main causes of sleep apnea is narrowed or blocked airways. They can found in the nose, throat or mouth (2). Besides, if something prevents your brain from sending signals to the breathing muscles, sleep apnea might occur as well. The National Sleep Foundation published a study showing that over 18 million Americans suffer from this problem and it is more common in males than in females. There are some health problems that actually raise the risk of sleep apnea, for example, obesity, heart diseases, or narrow throat. This problem seems to affect the old more often and it can be transmitted in genes. Those who use alcohol or tobacco excessively are more likely to experience sleep apnea. Symptoms of sleep apnea are various and it is possible that you will not experience all of them. Sleep apnea is a possible catalyst for many health complications in the long term, such as memory problems or stroke. Thus, it is better to address this problem as soon as possible. In addition to conventional sleep apnea cures, you have quite a few sleep apnea treatment options. 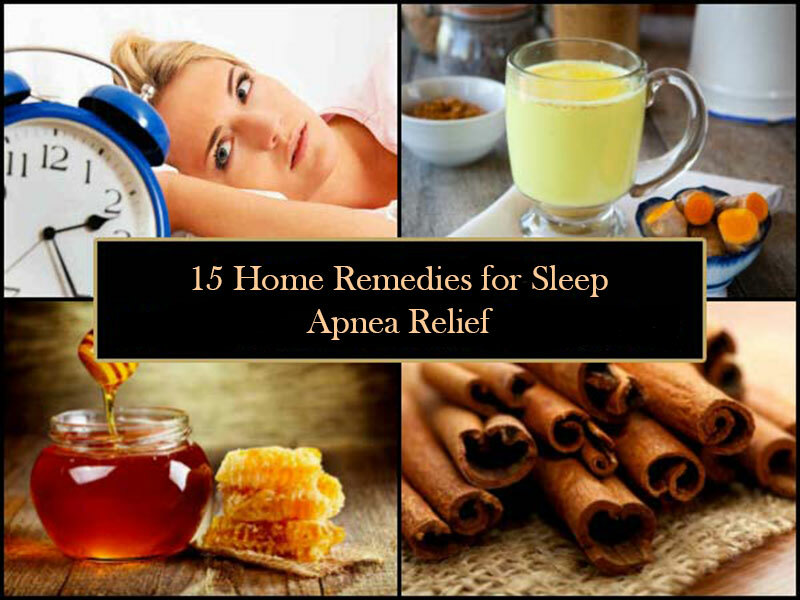 Here are top 15 natural home remedies for sleep apnea that prove to be effective in most people. One of the first natural home remedies for sleep apnea that you might not expect is lavender. In fact, this flower has been commonly used to deal with many problems related to sleep quality, thanks to its sedative, relaxing and soothing qualities. Lavender will reduce the risk of muscle obstruction in your throat and this will help improve the sleep quality. Add dried lavender buds (2 tsp.) into hot water (1 cup). Steep them in about 5 minutes and get it strained. You can consume it with honey several times per day. All of them bring the same results – sleep apnea relief. Garlic is among top natural home remedies for sleep apnea thanks to its anti-inflammatory quality. This means that garlic can fight against inflamed respiratory system and enable you to breathe more easily. In addition, garlic is effective to relieve enlarged tonsils and reduce the risk of snoring. Besides, you should use garlic regularly in cooking. If you want to use garlic supplements, it is necessary to ask doctor for advice. One of the simplest and most available home remedies for sleep apnea is honey. It is strongly anti-inflammatory to relieve swollen throat. Moreover, it has lubricating effects on your throat, which helps to relieve snoring – an annoying symptom of this problem. Another benefit of honey is to enhance relaxation and sleep quality. If you want to avoid obesity and have healthy weight, you should also use honey regularly. You can also use black pepper powder to improve the benefits. Epsom salt is one of the traditional and basic home remedies for sleep apnea. Naturopathic practitioners also recommended the use of epsom salt in the obstructive sleep apnea treatment. Magnesium in epsom salt will have relaxing effects on sore muscles and improve sleep quality. Plus, its anti-inflammatory quality is effective to cope with inflammation. Sit in the mixture for about 20 minutes. You should do so before going to bed. This will help you get better sleep at night. When you mix turmeric with milk, you will have one of the most effective home remedies for sleep apnea. Amino acid tryptophan in milk has positive impacts on sleep quality, while the anti-inflammatory quality of turmeric will help you breathe more easily. When the mixture is warm, consume it slowly. You should use this mixture about half an hour before bedtime. Loaded with a huge amount of magnesium, almond is the next tip on how to fix sleep apnea. This mineral plays an important role in muscle relaxation and contributes to great sleep. Besides, almonds are crucial to the regulation of our internal clock. Another way to make use of almonds is to use toast and almond butter at least 60 minutes before bedtime. Among herbs for sleep apnea treatment, you can find peppermint which is available in many places. With anti-inflammatory quality, peppermint can improve smooth breathing and lower the possibility of airway blockages. You can also use peppermint to escape from snoring. Besides, you can also prepare its tea by steeping peppermint leaves in hot water in 10 minutes and getting it strained. A bit honey will boost the benefits of its tea. With sedative effect, cinnamon is undeniably one of the most effective home remedies for sleep apnea. This ingredient has been widely used to cope with a variety of breathing problems, mainly related to sleep quality. Mix a bit honey and consume it before bedtime. Note: Cinnamon might not work for people experiencing medications, so make sure you ask doctor for advice first. With great influence on our internal clock, walnut is another home remedy for sleep apnea that you should remember. It is also loaded with antioxidants and some compounds, such as melatonin, that support your sleep well. You just need to eat them before bed time. However, some people may have allergy to walnuts and without notice, this problem might be life-threatening. Thus, make sure you have known your condition well before using this sleep apnea relief. Banana can be considered as one of the most nutritious fruits that should be consumed every time. Its nutrition content includes a lot of minerals, such as magnesium, serotonin or melatonin. All of them have wonderful effects on our nerves and muscles. Therefore, banana works as effectively as any other home remedies for sleep apnea. The recommendation is to eat bananas on the daily basis. Indian gooseberry is abundant in many types of vitamins, but vitamin C is worth mentioning most because it can strengthen our immune system and prevent infections. Thus, it is one of the best home remedies for sleep apnea. Consume the mixture once on the daily basis. Besides, honey and indian gooseberry would be one of the best mixed solutions for sleep apnea treatment. Olive oil is just one of many sleep apnea essential oils, but it seems to be most famous. There are many reasons why it is one of the best natural cures for sleep apnea. It is loaded with many vitamins, especially K and E, and fat. Besides, olive oil provides a lot of moisture to promote the elasticity of your skin. Take warm water to cleanse your neck. This method should be applied 2-3 times every day until you notice improvements. For years, chamomile has been well-known for its soothing and relaxing qualities. And we can definitely take advantage of them in the sleep apnea treatment. There are chemical compounds in chamomile that stimulate sleepiness and ease sore nerves or muscles. Furthermore, it is anti-inflammatory to help you get over airway obstruction quickly. Consume it at least 1 hour before bedtime. Besides, as mentioned above, the use of chamomile oil is appreciated as well. Another available essential oil that works for sleep apnea treatment is eucalyptus oil. It can be inhaled directly to have positive impacts on the muscles and prevent sleep disorders as well. You should use it before bedtime in order to get the best sleep which enables you to regain energy for the next day. Last but not least, throat exercise is an important tip on how to stop sleep apnea. It aims to not only reduce the risk of narrowed airways but also make our muscles stronger. Repeat this method 5 times on the daily basis to support the flow of air in the nose. While home remedies for sleep apnea are important, you ought to know some rules in its treatment so that the effects will be permanent. Alcohol and smoking are common obstacles that only worsen the problem, so if you are addicted to them, you should put an end to them immediately. Do not consume big meals or caffeine within 2 hours before you go to bed. They might prevent you from sleeping well. You had better not sleep on the back. This position is known to block the airway. As sleep apnea without proper treatment may lead to death, you should consult doctors as soon as you find out it. It is estimated that this problem causes discomforts for up to 18 million people in our country annually. Instead of updating new sleep apnea treatment constantly, you should focus on how to prevent sleep apnea. It is because sleep is extremely crucial to our health and you should not let any problem disturb your sleep. You should follow regular sleep hours which will enable you to sleep more easily and better. Besides, a steam vaporizer or humidifier should be used in your bedroom so that it provides enough moist. Even when you do not experience this problem, it is a good idea to use some essential oils and massage yourself regularly.